This villa is part of a brand new 3 house complex located in the south part of the island. The location offers unique tranquility away from any other residential development and unobstructed stunning views towards Divouno and Kalafati Beach and the deep blue waters of the Aegean Sea. The villa, located on the left side of the complex, is fully furnished and has 4 bedrooms with queen size beds, 4 bathrooms with shower, a fully equipped kitchen and a spacious living room. The planning is such that up to 8 persons can be comfortably accommodated as bedrooms are located in the upper and lower floors of the house. The upper level has one master bedroom with a large open terrace enjoying splendid mountain and sea views. Three bedrooms and two bathrooms are located in the lower level. The kitchen and living room lead to a large veranda with a dining table under a wooden pergola and a private swimming pool, the perfect setting for residents to relax, dine or entertain guests. Amenities include TV, DVD player, CD player, microwave, coffee maker, Nespresso machine, dishwasher, washing machine, towels and linen. Baby cots, strollers, baby-sitting are also available upon request. We (a group of five) had a wonderful time while in Greece and at the villa. The villa provided everything we needed and having a private pool to hang around was ideal. The number of bedrooms and bathrooms was excellent as no one had to share. The fully equipped kitchen allowed us to go to the grocery store and cook for ourselves in the morning or come home after a long day and have a quick dinner. The only complaints would be there is no A/C, which you can deal with but only one bedroom was lucky enough to get a fan. If fans were provided in each room, it would have made the hot nights more bearable. The fans would also help mosquitos from landing on you while you sleep. Pavlos was a wonderful host; being accessible via text, email or phone was very helpful. He not only provided info about the villa but local information as well. This made it easier for us to navigate around the island (or tell our drivers where to go anyway). Overall, we had a great time and created once in a lifetime memories on the island and in the villa. I'm glad you had a nice holiday in Mykonos and the house was as you wanted it. Next year I am thinking to put ceiling fans in the bedrooms for the few days of the summer you may need them. I will be very happy to accommodate you again and meet you in the near future if you come again in Mykonos. Thanks again and I wish you to have a lovely winter. We spent a week on Mykonos with my sister's family and Pavlos helped make our stay wonderful. The house was a great size - 4 bedrooms with enough bathrooms to cater for 4 adults and 2 little toddlers. Enough living space and outdoor space to let everyone spread out and the little ones run around too. 1 bedroom on the top floor with an adjoining balcony and en suite. The main level is the living room and open plan kitchen and 2nd bathroom. Downstairs is 3 more bedrooms with 2 bathrooms. Pavlos made the stay so easy. He's fantastic at communicating beforehand and was available throughout our stay for whatever questions we had. His recommendations for beaches and restaurants were great too. For a quick and tasty dinner at less than typical Mykonos prices, his recommendation of Kalammmakia was great! The pool was lovely and was great for the 6 of us. The night lights in the pool were really nice and the view in the evenings is what the photo shows. There's a supermarket 5 min drive away with an excellent bakery next door and brilliant gelato too! If you have little ones then this is a good place - the neighbours are lovely and we never heard any noise from any other homes. The best way to find the house is using the GPS coordinates the Pavlos sends - typing them into Google Maps takes you straight to the house. The only little downsides that we had during out stay was the heat and flies on the island. The island was particularly hot for the time of year and the rooms struggled to keep cool with the fans provided. Sadly we couldn't open all the windows/doors due to a large amount of flies randomly on the island and not many windows/doors had screens on them. That was the only downside of the trip. But aside from extremes of nature it was a lovely place to stay. An extra mention to Pavlos - exactly the type of owner you want to rent from. As I said - always available on the phone and when a storm took out the aerial, he organised a repairman to come the next day so we could keep watching the World Cup - top man! Would happily stay again. I would like to thank you for your kind words and the detailed review. I am very glad that you had a great time on your vacation in my house and I hope next time to have the opportunity to meet you. Despite the flies, you were very lucky because one week ago it was so cold at night, you couldn’t enjoy the pool area. Have a very nice winter! Perfect setting and well equiped villa with an amazing view. Very nice terrasse and swimmimg pool. The friendly owners were always available and did everything to make our stay confortable. We really enjoyed our family holydays and will definitively come back to Tranquil Villa! 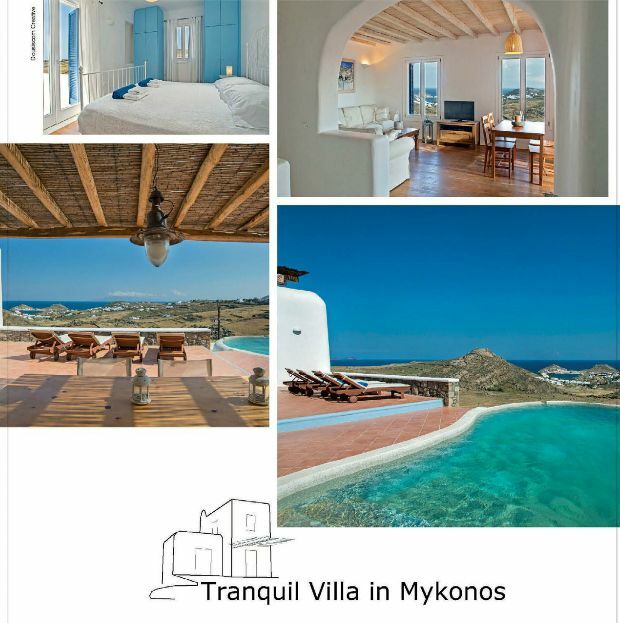 Very good villa and location! We were lucky to find this villa and the owners which are next door, always very kind and present for any need! The villa is exactly as you see in the picture of the website. Everything is new, clean and working! It is located 5 minutes from one of the best beach, Kalo Livadi and from the village of Ano Mera. You need car. a good choice! Ideale Zimmeraufteilung, ausreichend Badezimmer, gut ausgestattete Küche, erfrischendes eigenes Pool, schöne Aussicht - ideal für Ruhesuchende. Ca 20 Minuten nach Mykonos Stadt, max 10 Minuten zum nächsten Strand - Lia ist sehr empfehlenswert! Thank you very much! We hope to accommodate you again in the near future.